Rudolph looks very adorable and very exhausted after helping Santa deliver all his presents. I love the fireplace and fire to the side and how you create shadows. Adorable. Your video has inspired me to dig out my copics and give colouring another try. You make it look so easy! Love your videos and your tips. OK, don’t need to win because I loved it so much I already ordered the stamp! Just wanted you to know that it’s another OUTSTANDING card! Thank you! He is truly a cutie! I get do nervous to add all the shading you do but you make it look so easy. Thanks for the video. You always make me feel like I should try to do it myself. thanks for that. Your card turned out so cute!! You make it look so easy, will have to give it a try! You never stop amazing me. I look at this card and wish I could send something so beautiful to someone. Maybe someday after lots of practice. Thank you for showing me wonderful things to do with a simple stamp. Have an awesome day. Such a cute image. Thank you for always inspiring us! Thank you Sandy! You are amazing and I always love watching and listening to your videos. I always learn something new each and every time I watch one. This stamp is adorable but you really stepped it up with your background. LOVE LOVE LOVE IT! Thanks again for sharing your talent! OH my goodness…. You always make it look so easy and your cards are just simply gorgeous!!! I am always in awe of you!! You truly are an inspiration to me!!!! I just bought this stamp. I love it! Yours is fabulous, as usual! So sweet!! Love your background and so enjoy watching you color!! Thanks for all the inspiration too! love the coloring, I feel like I’M sitting in front of the warm fire! As always, you amaze me with your shading and “view” … thanks, Sandy. What a cute reindeer. Beautiful coloring! It’s clear you love what you do as you create beauty. I don’t know all about you but you must be or have been a teacher as it’s fun to see your videos. I always learn so much. Sandy, You are an awesome teacher. I could watch you color all day long and I learn so much from you. Your backgrounds are amazing!! Thank you so much for sharing with us and inspiring us to try different things and use our artistic abilities to create. It’s all about creating and having fun and you make everything you do look so amazing. Thanks again. I love that card! Cute stamp set! Love the background and I love the colors you used on the reindeer! Sandy – love the little “world” you created for your reindeer – he’s so stinkin’ cute! Can’t believe that anyone would ding you about not having a more realistic fireplace, when the subject is a cartoony little guy like this – but everyone is different. Just remind them about Artistic License! It’s your world, so you can do it your way – which is perfect for practically all of us! Oh – I think that’s undoubtedly a hand-braided rug he’s lying on, don’t you? Warmer and warmer! This has been a great series – can’t wait to watch these videos again and again – Thank you so much! I like how your coloring is so realistic. Thank you for all the teachable moments that you include in each video. I’m loving the backgrounds series. love it You make doing that fireplace possible for me and many others I’m sure. Thanks for sharing your vast knowledge with us. What do I think? I think you are an awesome artist. This card is absolutely gorgeous. The colors, the shading the rug…everything looks so real. Super cute design. Love the little image. Thanks for sharing!!! Love the way you really brought him to life with all your background details. So cool! You share so many great ideas. Love watching your videos always gives me something to strive for. I like the tips about using the YR’s instead of the E’s for the reindeer. It looks so much warmer. One day I may learn to build up color as you do. Sigh. Once again, Sandy, you’ve hit it out of the park. Thanks for all the tips on shading! You were right. More in the background would have been way too much to take in. This is stunning. I got all excited today, 60% off coupon at Michaels for art brushes paints and markers, but in the fine print: copics were excluded! Total bummer. I did get a Windsor and Newton marker to try. I looked at the Prismacolors, but they didn’t have the soft gray blue I was looking for! I pledge to continue working with my alcohol markers, even if they aren’t Copics!!! Thanks for it all. Brilliant idea by Stamping Bella to have you add backgrounds and have you color in the cards. Planning to order the reindeer stamp. I have actually tried out some of the backgrounds you suggested and been relatively pleased with the results. Yeah Sandy!!! Sandy, he is too cute; love the fireplace! I’m with you, Christmas is coming up quickly and that does feels crazy! This amusing Rudolph stamp has such simple and flowing lines along with a whimsical look is a stamp I truly like. 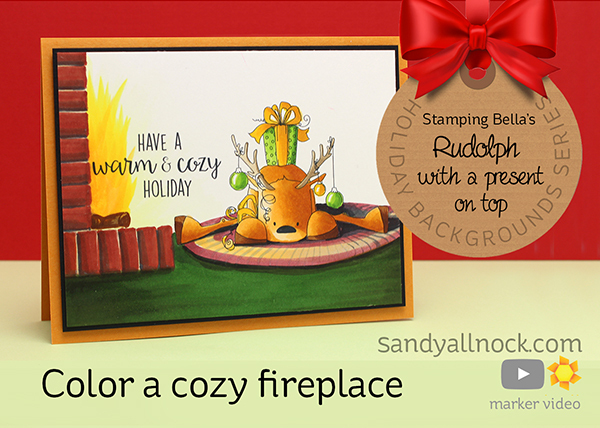 Your color tones have good contrast to show off the comforting, dancing fire reflection on Rudolph’s body. Even the rug appears rough and coarse. Your vibrant, confident copic work showed how one simple image (the reindeer) can, in the end, become a “scape”, in this case a home-scape. That card is too darn cute! Fabulous series Sandy ! I’ve been given a new eye for colors since watching your Copic videos! Simply adorable. You are my COPIC hero, and your videos are always fun and easy to watch. I love how you added the scene. You are so creative and talented. I would have never thought of taking blank space and drawing in a scene. You make it look so easy. I just love this reindeer. So cute. Great card. Thanks for sharing. Love, love everything you do! You make it look so easy but I know it takes a lot of practice. Looking forward to all the backgrounds. Great work keep inspiring me to try my hardest to do better. I appreciate the kick in the rear that you give me with every video you post. Awe – he’s so adorable!! Your coloring and blending are awesome as always!! I absolutely love your videos. Thanks so much! !